You got money ever time something bad happened; Millionaires were rich because they were unhappy all the time. This was probably caused by hearing things about money not buying happiness, there were also a lot of arguments over it when my parents got divorced, and my mom gave me 5 dollars when my cousin broke my Barbie Pegasus. Hefty One wrote: When I was a child I remember thinking a sheet of paper was 2-dimensional. This pissed me off to no end as a kid. Teachers would often cite paper as an example of something that was two dimensional, but thanks to a disgusting amount of exposure to videogames, I knew what 2D really meant, and that's SIDE-SCROLLERS... and also no depth, because plants in 3D games were often composed of just a couple 2D planes and would often be neigh invisible if you were looking at it from the wrong angle. What frustrated me the most though is that teachers would argue with me when I corrected them. How stupid do you have to be to understand that a piece of paper is a three dimensional object? It still irritates me to this day. I used to think that all TV was live. When they zoomed forward in time, it confused me to no end. I also used to think that they had to re-animate or film the theme song each time they made a new episode. Video editing was an amazing discovery. I used to think that my big brothers were awesome. Thank god for their girlfriends. I am a Full-Time Ninja. I just now remembered that I used to think that you died every time you went to sleep, and that you were revived when you woke up. I don't know where I got that conception from. Benstudios wrote: I used to think that my big brothers were awesome. Being a big brother myself, I never really realized that big brothers are supposed to be assholes to their younger siblings. But they aren't exactly nice to me...I don't even know whether that was a good thing. 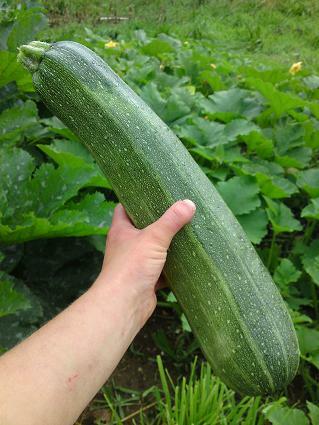 If you plant a cucumber, it will grow up into a marrow. Plasma Man wrote: If you plant a cucumber, it will grow up into a marrow. ...how did you come up with that idea? Isn't it obvious? Cucumbers look a lot like marrow seeds to me. And yes, I just came up with it because they looked similar. I also thought that courgettes and cucumbers were two different fruit from the same plant. My grandparents used to grow huge gherkins and claim they were cucumbers. Alas, they would serve them as such. I used to wonder what the little hole in the middle of bars of deorderant was for. Kurushimi wrote: Isn't it obvious? Cucumbers look a lot like marrow seeds to me. Ohh. I thought you meant bone marrow or something. Nah, I guess it's like a zucchini or something. Actually, I had no idea what a marrow was at the time. I was being completely sarcastic. Childhood misconception: It's pronounced HY-po-TEN-use. Grop wrote: My grandparents used to grow huge gherkins and claim they were cucumbers. My grandpa served deli chicken on Thanksgiving and called it "turkey". I went for years and years without ever seeing the word 'dentures' written down, and so I concluded that the correct spelling was probably 'denchers.' 'Dench' always seemed like a reasonable onomatopoeia for biting your teeth together, so it made sense at the time. I suspect that someday I'm going to spell it like that by accident and things are going to get really awkward. When I was around 12 or 13, before learning about the existence of programming languages, I thought videogames could be made with Microsoft Access. It was the only Office application I didn't understand what it did and making videogames and other complex programs seemed like the only thing about computers I didn't know how was done. So, I put two and two together and... yeah. You're better than I, then. I thought it was done in a text editor. Without a compiler or anything, that if you just renamed an .exe to .txt and knew what you were doing, you could tell what the code was doing. SecondTalon wrote: You're better than I, then. I thought it was done in a text editor. Without a compiler or anything, that if you just renamed an .exe to .txt and knew what you were doing, you could tell what the code was doing. It's technically true, for large enough values of "know what you are doing". Me too, because I had to edit these .bat files quite early. I was quite frustated at not understanding .exe files. Grop wrote: Me too, because I had to edit these .bat files quite early. I was quite frustated at not understanding .exe files. I tried doing that, and then was surprised that the open source program then became unrunnable. (Because most text editors add the CR and/or LF. Luckily I discovered the Hex Editor program, so it would work as long as they didn't include checksums in the files. If I've got this right, you edit(ed) your open source programs by directly modifying the executable via a hex editor, not by altering and recompiling the (presumably freely available, hence open source) code? I'm not sure if that's extremely impressive or extremely stupid . . .
Perhaps he said that in a humorous attempt to stop big corporations from suing him since most commercial software licenses have clauses that prohibit you from reverse-engineering them and I guess editing the executable can be considered as doing that. Or maybe I'm just reading too much into it and the software he first experimented with these things on just happened to be open source and he randomly decided to include that information. Reading back my post, I probably give the impression that I am a really insane person, don't I? But open source software specifically grants you this ability. that when two people got married the wife magically got pregnant. Now that i think about it my theory doesn't count for single moms. Pretty much everyone I know was conceived out of wedlock, and therefor that's how they're married. (Everyone was an "oops") This is why people get married and for no other reason, you see. Ran4 wrote: I thought that I could read when I was 2. I couldn't. I pretend-readed. A year later, when I was 3, I saw someone around 2 do the same thing, and I thought that it was completely stupid... But I didn't realized that I did that just a year before, I didn't get that until a few days later. That's still one of my most embarrassing memories: me pretend-reading. I mean, c'mon! It's so silly and stupid. Ugh, if I ever get kids, I won't be afraid that my children will be gay or something arbitrarily like that; I'll be scared senseless that my child might one day pretend-read. Needless to say, I fled the house in terror screaming "It's going to explode!". A neighbor found me in a park next to where I live, whimpering. The result? My dad had to reinstall the OS, using the CD. For the next 3 years I thought bomb squads were simply installing a program on the bombs so they wouldn't explode. I learned to read pretty early in life, but my brother took a while. For a few years I wondered what it was like to not be able to read, since I couldn't remember. Did the letters just look blurry? Could he not see them? I didn't get that you could see the letters, but not know what they mean. I also remember not quite understanding the concept of a million, when on a Simpsons episode, Bart and Lisa missed a one-time showing of a special Itchy and Scratchy episode. They got back just in time to see Krusty say "they'll never let us show that again in a million years!" I didn't get what they were so upset about... so you have to wait a little while? In another case someone told me the dinosaurs went extinct 65 million years ago. Since that was a year ago, I started saying 66 million instead. I eventually learned the concept of a million, but still didn't know about rounding, so I updated my figure to 65,000,001. At one point I had the brilliant idea that if I told people I was blind, they'd believe me, and not mind me wandering into places I shouldn't, because I'd have no way of knowing. I somehow managed to uninstall windows 95 while trying to play monopoly as a kid. I clicked a bunch of things, the game didn't open so I clicked OK then went on to the next one. This is actually really common. Like, to the point that I've met adults who think this. How silly. Obviously God, being all-knowing, and having a Plan, would have seen this coming, and built Adam with an extra rib on one side, so he could remove it later to build Eve. And to cover his tracks. Just like how scorpions have more legs on one side, or something. Maybe it's lobsters. I forget. I can't remember where I read it, but I read a Genesis storybook at some point which concluded, quite matter-of-factly that this was why, AS WE ALL KNOW, men have one less rib than women. Luckily I wasn't paying much attention, possibly preoccupied with whatever I was interested in at the time, and mostly forgot about it until now. My parents still believe this. My cries of "count them, then!" are just met with blank stares. The logic of "How many one-armed men have one-armed children" doesn't work?